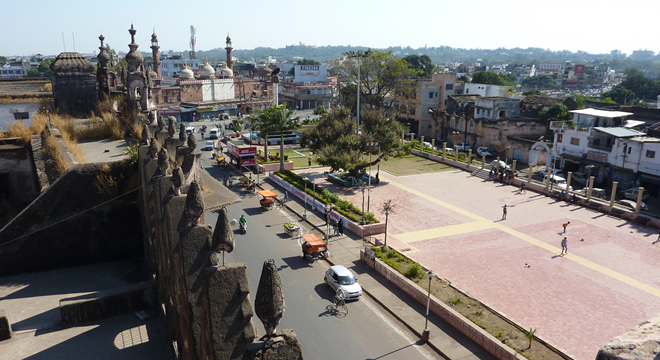 Bhopal is the capital of Madhya Pradesh, a vast state of 60.4 million in northern India. With a population of 1.46 million, Bhopal is a small city by Indian standards. Compared to other states Madhya Pradesh’s human development indicators are lower than average. The main language is Hindi. 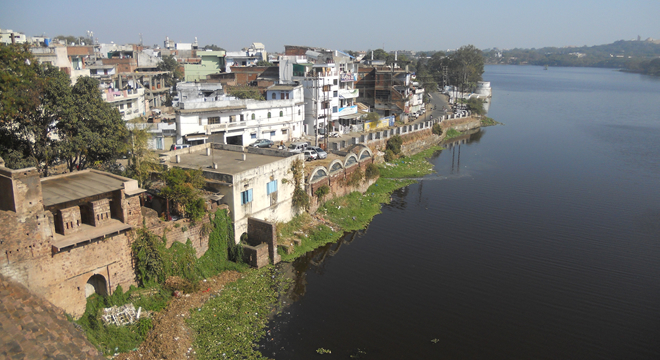 Bhopal has several lakes, and is in effect two cities: the old part of the city is largely Muslim with mosques and lively bazaars. On its outskirts lies the former Union Carbide plant, site of the 1984 disaster that remains an urban challenge. The earliest reference to Bhopal is from 1010. The Living Architectural Heritage of Bhopal (2005) by MANIT’s Savita Raje in collaboration Serge Santelli (School of Architecture, Paris-Belleville) is an excellent guide to Bhopal¹s Muslim and British heritage, and documents the architecture of the historic core of the city showcasing the expression of its multi-cultural history. One of Bhopal’s female rulers, Shah Jahan Begum, had ambitions to build the largest mosque in the world, and work began on Taj-ul-Masajid in 1877. Many of these buildings are dilapidated and are the focus of one of the projects. Importantly they demonstrate and embody the principles for environmental sustainability. 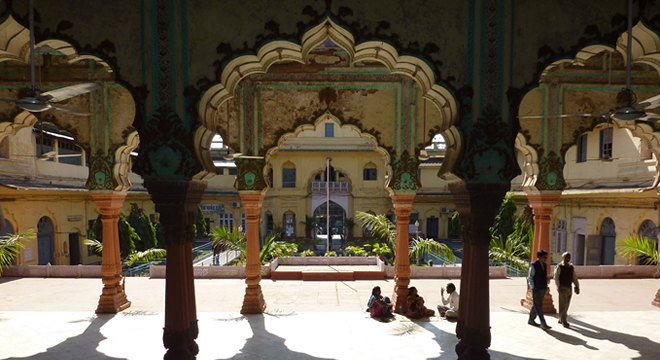 Indore, the economic centre of the state also has important heritage buildings, as do the cities of Jabalpur, Ujjain and Gwalior. The Khajuraho group of monuments, a UNESCO World Heritage Site, is approximately six hours by train.Bhopal lies midway between two UNESCO World Heritage Sites: Sanchi, an hour’s drive to the north of Bhopal and Bhimbaithika, again an hours’ drive towards the south of the city. The city abutting the downtown is modern, with wide roads, new apartment buildings and expansive parks. The Bharat Bhavan Art Gallery and Cultural Centre by Charles Correa has a superb collection of contemporary art; similarly the National Museum of Mankind displays the richness of India’s Tribal culture. In the extensive grounds buildings from various regions in the country display India’s extraordinary architectural variety, from desert houses to buildings from the hot and wet tropics. At a time of national growth, Bhopal has opportunities to re-position itself: to build on its social, cultural and physical assets that include the potential for tourism (national and international), knowledge building (tertiary education and training) and its position as a cultural hub for the state. At the same time the city faces the challenges of inclusive and sustainable urbanisation. These include: the upgrading of buildings and the public realm, integrating migrants and marginal groups, overcoming the legacy of the 1984 Union Carbide disaster, addressing ‘old city- new city’ differences, and climate change. The new national policy, Rajiv Avas Yoyana Guidelines for Slum Free City Planning, will impact Bhopal’s development. A recent Cities Alliance /World Bank grant for a planning support unit, Jawaharlal Nehru National Urban Renewal Mission (JNNURM) and the DFID funded MP Urban Services for the Poor (MPUSP), in association with the Municipal Corporation of Bhopal, are helping to build urban planning capacity and address urban problems. Slums and informal development are present throughout the city. 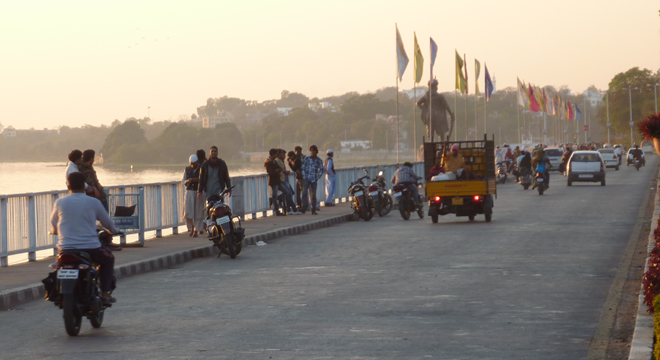 The VIP road links old and new Bhopal along the lakeside, and provides easy access to the Bhopal airport. 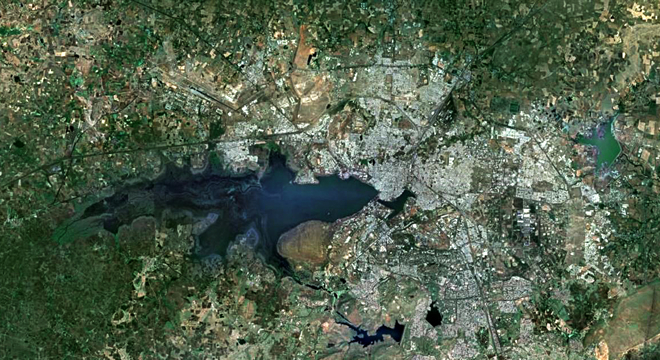 Bhopal is well connected to major cities by air and train. There are convenient flights to Mumbai (1.5 hours), Delhi (1 hour) and Ahmedabad (1.5 hours) and Bhopal is a major rail hub for trains running between South and North India.